Gabriella Santosa and Florence Gschwend, winner and runner up of the Althea-Imperial Prize. 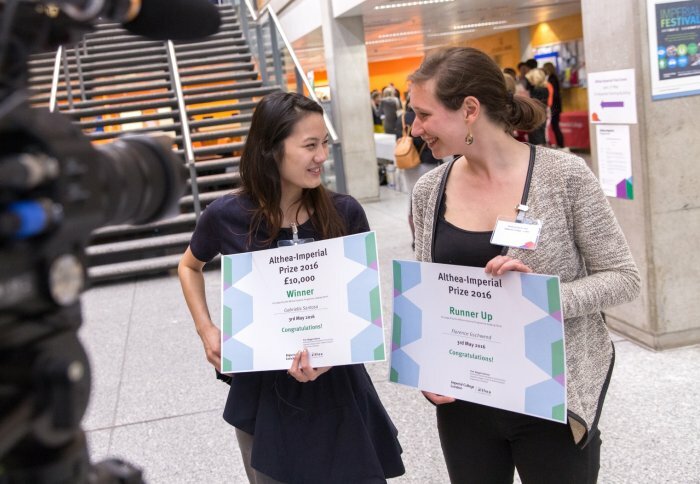 New membrane technology to filter hazardous micropollutants from water won top prize in Imperial's pioneering entrepreneurial programme for women. Gabriella Santosa, a final year undergraduate student from the Department of Life Sciences, took home £10,000 of funding at the finale of the Althea-Imperial Programme last night. Althea-Imperial women do not just produce a product in search of a market. They produce a solution to a problem. 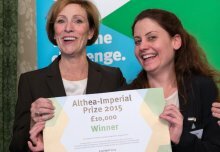 The Althea-Imperial Programme is a unique collaboration between Imperial and the Althea Foundation, a social venture fund. Now in its second year, the initiative is designed to inspire a new generation of women in science, technology and business. Gabriella’s start-up, CustoMem, aims to tackle a key challenge for the textile industry – polluting heavy metals that are released during the apparel manufacturing process. These contaminants are left behind after current wastewater treatment methods, rendering freshwater supplies unusable and contributing to water stress. CustoMem creates membranes which not only capture and remove traces of these heavy metals and other micro pollutants from the water, but allow them to be recycled. The team use a specially engineered bacteria to produce the membranes, meaning that the manufacturing process is also sustainable, low cost, low energy, and doesn’t rely on or produce any hazardous chemicals. 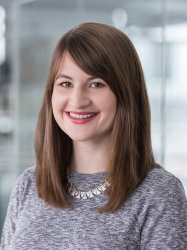 Gabi and her team plan to use their winnings to help secure the required patents for their technology and roll out a pilot programme in Wales, where they hope to treat 5,000L of water a day with their membranes to demonstrate how they work in an industrial setting. Speaking of her success, Gabi said: “I woke up still smiling this morning. “I’d got used investors speaking to my male colleagues rather than me when we meet them. It was refreshing to be in this environment, surrounded by so many inspiring women, where I could have my voice heard and learn what leadership meant for me as a woman." Gabi beat off competition from six other candidates to secure the top prize, after they all pitched their ideas to a panel of industry and business experts including Professor Sir Mark Walport, Chief Scientific Adviser to the Government; Maggi Bell, Director at Capita; and Kate Bingham, Managing Partner at SV Life Sciences. This year, the judges opted to pick just one runner up, meaning that she too received a prize of £10,000. Florence Gschwend from Chrysalis Technologies was chosen for second place. She’s developed a process for the conversion of metal-contaminated waste wood into bio-based fuels, plastics and other useful materials. Speaking at the event, Professor Alice Gast said: “If you give women an opportunity, they seize it. Women by their very nature are entrepreneurial, they just need the confidence to make the leap into an uncertain future and pursue their idea. “Althea-Imperial women do not just produce a product in search of a market. They produce a solution to a problem." Professor Gast was introduced by Imperial's champion of the programme, Professor Maggie Dallman - Associate Provost (Academic Partnerships). Alexsis de Raadt St. James, Founder and Chairman of The Althea Foundation, said: “The Althea-Imperial Programme shows what happens when you give talented, entrepreneurial women the space to cultivate their ideas. "The talent, enthusiasm, and drive of this year’s entrants are truly astounding. These remarkable women have very bright futures ahead of them, and I look forward to seeing how their ideas develop." You can find out more about Florence's technology at Imperial Festival on 7-8 May. In interactive performances on Saturday and Sunday, she'll be demonstrating how chemical engineering researchers are splitting wood into its components. A wearable device which helps users monitor the light they receive from their surroundings and help them map the effect this has on their circadian rhythm. A low-cost home testing kit which would allow farmers in isolated rural communities in the developing world to test their livestock for disease without needing to rely on lab tests or specialist expertise. A wireless ECG device which would allow for the continuous monitoring of electrical signals from a patient’s heart – enabling a more comfortable experience for patients and reduced risk of hospital infection. A low-cost device and app to help people monitor moles on the skin and increase the chance of early detection of skin cancer.